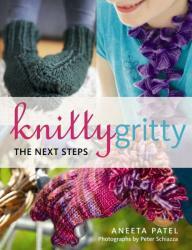 Aneeta Patel’s Knitty Gritty – the next steps, is a different kind of book to the last two. 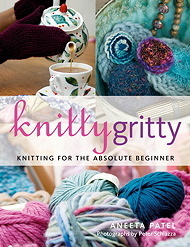 This is a technical tome which is a development from Aneeta Patel’s first Knitty Gritty beginners guide to knitting. Through clear photographs and little ‘Top-tip’ sections Aneeta explains subjects like picking up stitches, adding yarn, sewing up garter stitch and mattress stitch. Although many patterns require these actions, there are few books which clearly explain how to do it. I think knitting frequently gets left in the project bag because it is these last stages that just can’t be faced. I am not that fearful of most things yarnwise, but I have learnt some valuable things flicking through this book. What is particularly brilliant about this publication is a couple of key patterns. Aneeta has written up patterns like a beanie hat, socks, gloves and provided instructions to scale them from a baby to a male adult. I think so many people will find this helpful and a great basis to start designing their own knitwear. A really good addition to your knitting library and a great place to go back and check you finishing technique. Read more from Emma's blog here.